A tablet computer, commonly shortened to tablet, is a portable PC, typically with a mobile operating system and LCD touchscreen display processing circuitry, and a rechargeable battery in a single thin, flat package. Tablets, being computers, do what other personal computers do, but lack some I/O capabilities that others have. 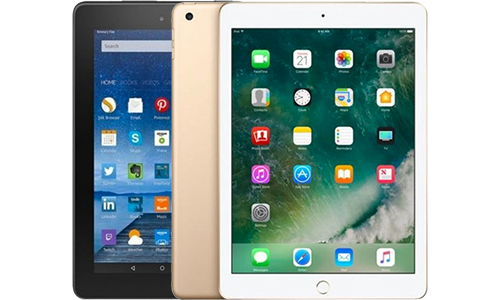 Modern tablets largely resemble modern smartphones, the only differences being that tablets are relatively larger than smartphones, with screens 7 inches (18 cm) or larger, measured diagonally and may not support access to a cellular network. A device more powerful than today’s tablets appeared briefly in The Mote in God’s Eye (1974). The Star Wars franchise features “datapads”, first described in print in 1991’s Heir to the Empire and depicted on screen in 1999’s The Phantom Menace. In 1992, Atari showed developers the Stylus, later renamed ST-Pad. The ST-Pad was based on the TOS/GEM Atari ST Platform and prototyped early handwriting recognition. Shiraz Shivji’s company Momentus demonstrated in the same time a failed x86 MS-DOS based Pen Computer with its own GUI. In 1994, the European Union initiated the NewsPad project, inspired by Clarke and Kubrick’s fictional work. Acorn Computers developed and delivered an ARM-based touch screen tablet computer for this program, branding it the “NewsPad”; the project ended in 1997.